Donâ€™t be fooled by inferior products that claim to be premium. 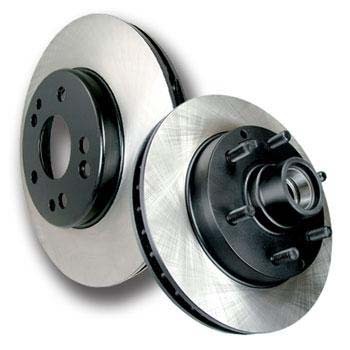 StopTech Premium Rotors feature Original Equipment specifications and production processes. These StopTech Rotors are manufactured to meet QS and ISO Quality System Standards. Our global suppliers have already passed these stringent quality assurance standards because they currently supply products to OE manufacturers. StopTech Premium Rotors utilize an Electrocoating finish that provides long lasting corrosion protection. E-coating is a superior electro-statically applied finish designed to withstand 400 hours of salt water exposure without rusting. Phosphate finishes utilized by other manufacturers provide only minimal protection from the elements; these finishes are generally only effective for the shipping and storage portion of a rotorâ€™s life. The addition of heat and moisture eliminates the effectiveness of phosphate finishes resulting in immediate corrosion once installed in the vehicle.